I am delighted to announce publication of our latest open-access scholarly paper ‘Rethinking ‘Advanced Search’: A New Approach to Complex Query Formulation‘, which has just been published in the proceedings of the 41st European Conference on Information Retrieval (ECIR) in Cologne. This work is a collaboration with Jon Chamberlain and Udo Kruschwitz of Essex University, and accompanies our demo at the event. The paper focuses on the application of query visualisation to structured searching and in particular the challenges associated with the recruitment profession, and hopefully complements some of the more opinion or design-oriented posts on this site. I’ve appended the abstract below. For free access to a copy, visit the ECIR website. I am delighted to announce publication of our latest open-access scholarly paper ‘A Visual Approach to Query Formulation for Systematic Search‘, which has just been published in the proceedings of the 4th ACM SIGIR Conference on Human Information Interaction and Retrieval. This work is a collaboration with Jon Chamberlain of Essex University and Farhad Shokraneh of Nottingham University, and accompanies our demo at the event. 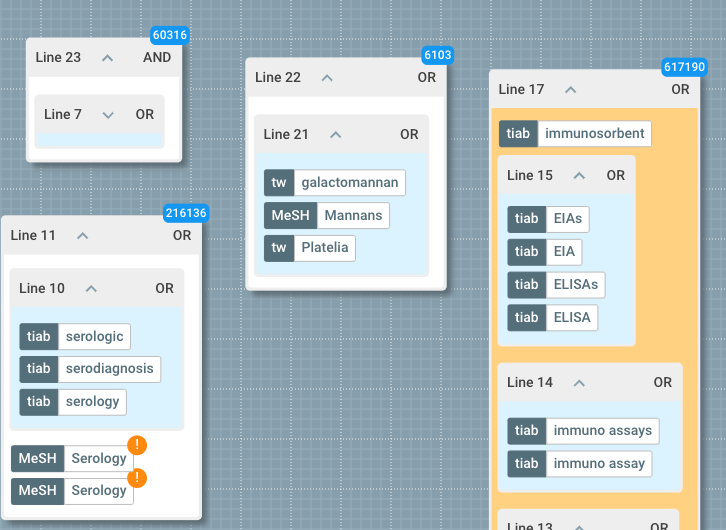 The paper focuses on the application of query visualisation to healthcare information, and hopefully complements some of the more opinion or design-oriented posts on this site. I’ve appended the abstract below. For free access to a copy, visit the ACM Digital Library. Google Scholar: not so smart? Most of us are familiar Google Scholar: a freely available subset of Google that indexes the world’s scholarly literature across a range of disciplines. With its database of over 389 million documents including articles, citations and patents, it has become an indispensable resource for scholars and researchers across the globe. Which is why we recently added Google Scholar integration to 2dSearch, thereby offering a tool of immediate utility to anyone wishing to search the world’s scientific literature in a systematic manner. If you were tasked with designing a universal framework for search query formulation, where would you start? Well, you could start from a command-line paradigm. After all, that’s the approach adopted by most query builders and ‘advanced search’ forms. But convention aside, is that really the best place to start? Personally, I am not convinced – IMHO command line approaches reflect the days when searches were conducted via remote terminals to subscription databases, and in that respect, they represent the past, not the future. Moreover, using Boolean strings to articulate complex information needs suffers from a number of fundamental shortcomings, in particular regarding scalability, efficiency and transparency. So what’s the alternative? 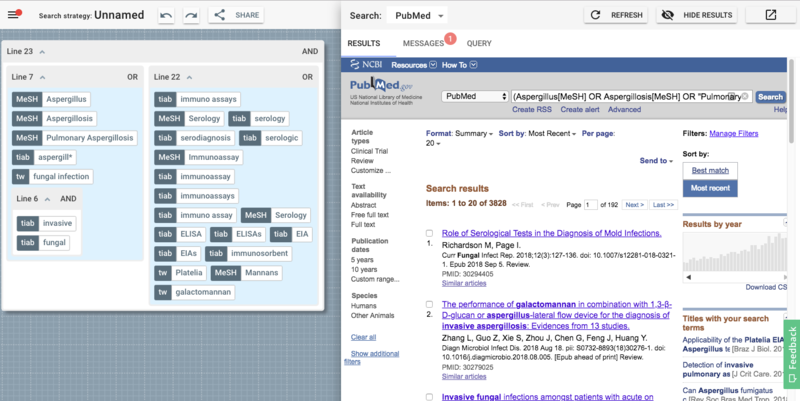 A couple of days ago I published a piece on Medium called “Searching PubMed just got smarter“, in which I talked about how we’ve added PubMed integration to 2dSearch, thereby offering a tool of immediate utility to anyone wishing to search MEDLINE in a systematic manner. The service has only been live a week or two, but the post did seem to strike a chord with a number of people. And some of that commentary got me thinking about various issues around reproducibility (with regard both to scientific research and to searching methodologies). But it also raised an issue around transparency, and the degree to which the formalisms we use to express information needs can scale to accommodate new use cases and requirements. 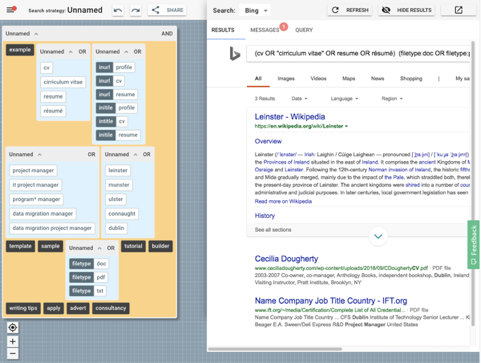 A couple of days ago I published a piece on Medium called “Towards a universal language for search“, in which I talked about how we’ve added Google integration to 2dSearch, thereby allowing a user to apply the same search strategy (or Boolean string) to search multiple databases. Of course, this may not matter much to your ‘average web searcher’, but for some professions, this is a big thing. 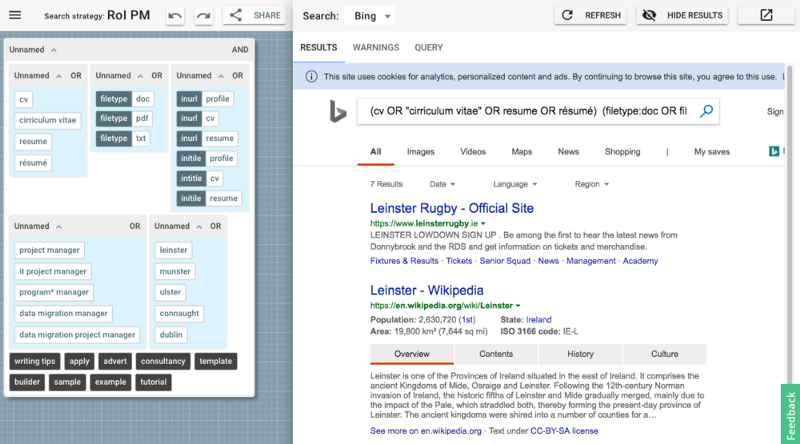 Now the point isn’t so much about Google (or Bing for the matter), that just happens to be the instance we have used to illustrate the concept. And crucially, the point isn’t about query languages either (in the programmatic sense) – important though they are, converting a user’s information need into a API call is a different problem. Instead, what we’re contemplating here is the prospect of a universal framework for information needs. Over the last few weeks I’ve been sharing various ideas about ways in which techniques from the field of data visualisation can be applied to help solve complex search problems, with particular focus on the process of query formulation. In those posts, we’ve discussed the scientific (and, one might argue, commercial) rationale for adopting such techniques in the development of future search strategies. But what we haven’t really considered thus far is legacy content – in particular, the many archive collections of solutions to common search problems that are stored as curated collections of Boolean strings and search filters. These repositories offer a vital source of inspiration and guidance and play a key role in the propagation of knowledge and best practice for a variety of professions.